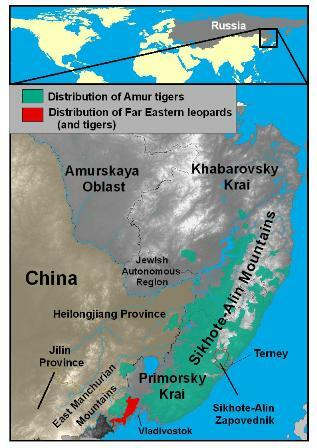 efforts encompass the whole of Russian tiger habitat – all of Primorskii Krai and southern Khabarovskii Krai. Since 1992 the village of Ternei, at the edge of the Sikhote-Alin Biosphere Reserve in northern Primorskii Krai, has been the center for our Siberian Tiger Project activities. This is also the center for our Blakiston's fish owl and musk deer work. Finally, we conduct field research on Amur leopard and tiger ecology in southwestern Primorskii Krai. WCS’s Russian representative office is located in the city of Vladivostok, the capital of Primorskii Krai.